Narendra Modi on Monday ridiculed the Congress for criticising his government over problems caused by the GST. 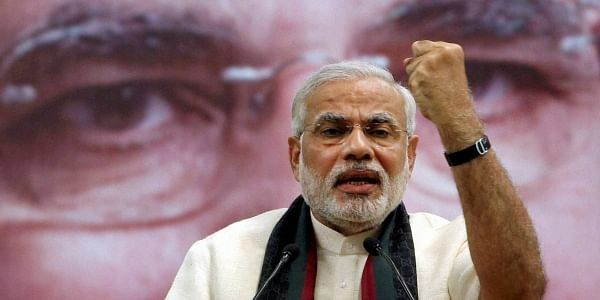 AHMEDABAD: Prime Minister Narendra Modi on Monday ridiculed the Congress for criticising his government over problems caused by the Goods and Services Tax and demonetisation and claimed these issues had been resolved. He also took a dig at Congress leader Rahul Gandhi. Modi claimed his government had initiated the unique Pradhan Mantri Mudra Yojana to encourage start-ups in the country, but the Congress did not have the intellect to figure it out. He said nine crore beneficiaries were disbursed loans of Rs 4 lakh crore to start businesses. "This is what we have done for employment of India's talented youths and very soon India will be third in the world in the number of start-ups. But the Congress people can't even think of it," he added. Modi was speaking in Gujarat's commercial capital and BJP bastion Ahmedabad, concluding his campaign 24 hours ahead of the last day of canvassing for the second round of polling to 93 assembly seats on December 14. "The GST is part of a new taxation regime practiced across the world and as long as we don't implement it, no bureaucrat or economist worth his salt will know about problems faced by trade and industry," the Prime Minister said. "After all, we were changing an entire system. So, there were problems. But we have resolved all issues now. And if there still are problems, we will handle that too," Modi added. On demonetisation announced on November 8, 2016, he said: "Those who are still crying hoarse over it more than a year later are those whom it pinched, while others have moved on." "Those who were hand in glove with terrorists could not find black money to help anti-India activities. Today, all those are behind bars in Tihar jail." Coming down heavily on Congress President-designate Rahul Gandhi, Modi said: "You say something, may be it is a mistake; you say it again, it may still be excusable; and third time, may be it is a political remark. But you do this again and again for two months. You think everyone is a fool, spreading lies everywhere." This was the first public meeting of Modi on Monday. It began two hours behind schedule, just as the Ahmedabad event was more than a couple of hours late. Reacting for the first time to the Congress leader's tirade 24 hours ahead of the end of campaigning for the second phase of polling, the Prime Minister said: "I went with a begging bowl to every nook and corner of Gujarat, asking people to send their girls to school. "Was I asking about the education of daughters of the Ambanis? Was I asking about daughters of Kilachand? I went from village to village in 45-degree heat to promote the education of the girl child," Modi thundered. "What do those born with a silver spoon in their mouth know about this. "I, as the Chief Minister, and my ministers used to take akrishi rath' (agriculture chariot) during sowing and harvesting season to promote modern farming," he said. "Our footwear got worn out, we have walked barefoot under the sun. They (Gandhi) may not have been pricked even once by a thorn in the foot." Modi intermittently asked the crowd in Patan in North Gujarat if they remembered that he did all this. "Tell me, did I or did I not? Not like this -- say it loudly. Raise both your hands in agreement," he exhorted the crowd. "You keep on repeating lies and think everyone is a fool to believe what all you say. I took out the 'krishi rath' to every village -- was it for the Adanis?" Modi asked.